The simplehuman 48 Liter / 12.7 Gallon stainless steel dual compartment touch-bar kitchen recycling trash can is easy to open from any angle with its unique touch-bar and stays open until you close it — ideal for food prep or while finishing up long chores. The touch-bar lid opens smoothly and evenly and lifts off for quick, easy liner changes. Its stylish stainless steel design enhances any home decor. Big and wide dual compartments make it easy to sort your trash and recycling in one convenient place with one side for trash and one side with a recycling bin for all your recyclables. 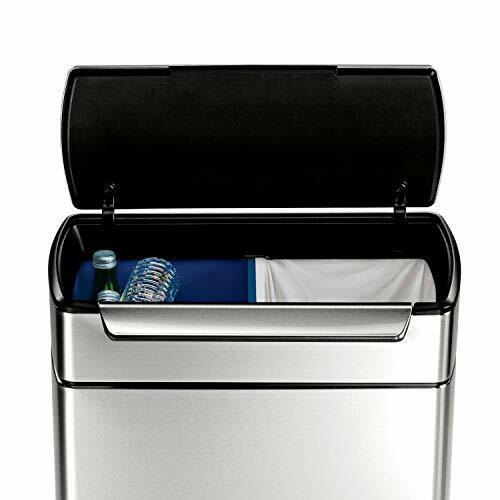 simplehuman Code G trash can liners are a perfect fit for this waste bin. They are made from extra-durable plastic with thick double seams to prevent rips and tears and have been rated among the top in strength comparable to other major brands. Extra strong to keep garbage in the bag — not on the floor or the bottom of your trash can. DUAL COMPARTMENTS: One side for trash, one side for easy disposal of recyclables. EASY-OPEN TOUCH-BAR- Easy to open from any angle - just tap with your elbow, bump with your hip or nudge with your knee. SMOOTH AND EVEN LID OPENING - Unique dampers and precisely angled springs control the lid so it opens smoothly and evenly. STAY-OPEN LID - The lid stays open for as long as you like - perfect for food prep or longer chores. BIG, WIDE OPENING - Specially shaped hinge moves up and out of the way for the widest opening possible without letting the lid hit the wall. LIFT-OFF LID - Lid lifts off easily for a quick liner change. FINGERPRINT-PROOF FINISH - Resists smudges to keep stainless steel shiny. ENHANCE YOUR TRASH EXPERIENCE - Extra-strong and durable Codes G custom fit liners fit this can perfectly for a cleaner trash experience.